As you can tell from most of my shots at this year’s Red Bull USGP, I was really at only two main spots on the track – Turn 2 (the Andretti Hairpin) and the Corkscrew. I moved around a little at each area but that is where the bulk of my shots came from. 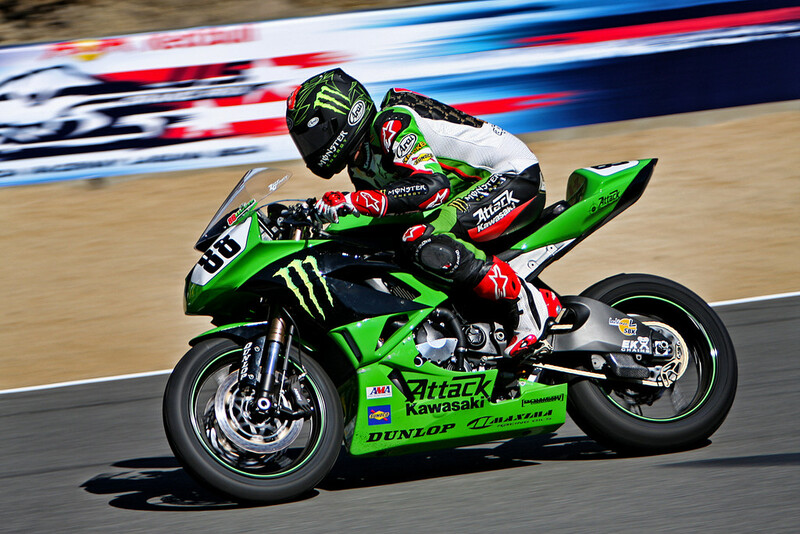 Shown above is Jamie Hacking on the #88 Attack Kawasaki in the AMA Pro Daytona Sportbike class race on Sunday, July 5. I like this pic a lot for a few reasons: I ride a Kawasaki sportbike daily, Monster would be my favorite energy drink (although I don’t discriminate if a Red Bull is handed to me! ), and the mix of colors really pops. I’m in the market for a new Arai soon and I think I’m leaning towards the green and black Monster rep (although it’s the Hopkins paint scheme). This entry was posted on Monday, July 20th, 2009 at 2:59 pm	and is filed under Blog, Photos. You can follow any responses to this entry through the RSS 2.0 feed.